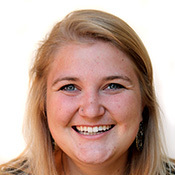 Lindsay Hueston is a Communications Associate at NETWORK, where she assists with messaging, social media and content creation to connect others to the mission of NETWORK and to keep them informed on current policy issues. Hailing from the Philadelphia area, Lindsay graduated from Saint Joseph’s University in 2016 with degrees in English and French and minors in Faith-Justice Studies and Leadership, Ethics, & Organizational Sustainability. She then served as a Jesuit Volunteer with JVC Northwest, where she worked alongside the homeless population in Seattle at a social justice-focused newspaper. Throughout her undergraduate years and beyond, Lindsay has worked at the intersections of writing and justice in faith-based contexts, and is excited about nurturing these skills and passions at NETWORK. Lindsay enjoys the constant buzz¬ that there’s always something going on, politically or otherwise, and that the people in DC are so engaged!